The judiciary in Nigeria is a colossal failure with a collateral damage to it’s citizens due to recklessness. Nigerian legal system is a disgrace to Mankind and a tragic national plunder. As justice of “cash and carry”, it has informed a paradox in the criminal justice system where the innocent is criminalized the criminal walks free as long as they are able to pay the price. According to Judaic teaching “justice is the Ultimate declaration of Gods will , our means of serving him and approaching him.” Justice is no more or less than fairness . It breeds harmony . It gives comfort and hope to the afflicted and gives us a chance to feel that life is worth living, that no matter how desperate things might seem , it tells us to believe that in end all will work out. It is therefore not only a means towards a harmonious society but altogether an instrument of prosperity Some nations are blessed with a judiciary system that delivers an efficient, effective, accountable and faire justice. Nigeria’s judiciary is remarkable for scandalous deficit of decency. On the scale, integrity remains very limited in supply and most of all, marked by a pervasive systemic corruption. According to Ribadu, Ibori was never the worst plunderer of public fund . 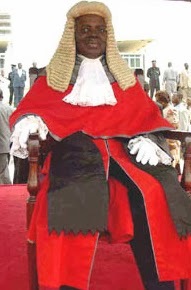 Governor kalu of Abia was notorious for scandalous misappropriation of public funds . Mr Kalu diverted public fund during his tenure as governor, 35 billion naira according to the states treasurer , to build a massive business empire . He used his mother, daughter , wife and Brother to plunder the states wealth. Kalu was never prosecuted . Notorious thieves terrifying and mindless criminals have walked free out of the courts in Nigeria. ( because judgment is pay as you go and the criminal justice system is cash and carry) The irony is that innocent citizens who are unable to pay for legal representation or bribe the prosecutors and police are sent behind bars for unlimited period of time This administration more than any records of past governance has produced too many sordid scandal of judicial plunder . A government commission investigating overcrowded prison found that some inmate have sat in their ram shackled cell for ten years or more without ever being judged or sentenced for any reason . many more were convicted without proven evidences. The experiences of Chigioke, Emeka and all the rest is a monstrous perversity of justice and this is happening on an epidemic proportion to too many young and innocent citizens. Nigeria’s addiction to corruption has created a massive propensity to criminality amongst the prosecutingbody(judges and police) Every one of them is on the lookout for money making opportunity. The criminal justice system is creating a massive number of criminal and over crowding the prisons paradoxically there is a massive failure to favor justice. If we are to live together in any society a certain measure of protection of rights and freedom of persons and properties is necessary; and should be equally guaranteed to every member of the community without regard to his status, personality or standard. The acknowledgment of this principle is what sets us apart as a civilized community. Society cannot not exist without the full measure of justice ; and the ranking of a people on the scale of being is determined by the role played by it’s justice system in the ordering of things. It is well know that any where money buys impunity chaos and disorder will reign. L’ Inexplicable explosion de la culture du tatouage .Quel paradoxe!